The captives were about to embark on the infamous Middle Passage, so called because it was the middle leg of a three-part voyage -- a voyage that began and ended in Europe. The first leg of the voyage carried a cargo that often included iron, cloth, brandy, firearms, and gunpowder. Upon landing on Africa's "slave coast," the cargo was exchanged for Africans. Fully loaded with its human cargo, the ship set sail for the Americas, where the slaves were exchanged for sugar, tobacco, or some other product. The final leg brought the ship back to Europe. The African slave boarding the ship had no idea what lay ahead. Africans who had made the Middle Passage to the plantations of the New World did not return to their homeland to tell what happened to those people who suddenly disappeared. 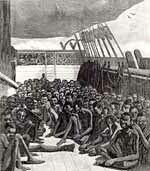 Sometimes the captured Africans were told by the white men on the ships that they were to work in the fields. But this was difficult to believe, since, from the African's experience, tending crops took so little time and didn't require many hands. So what were they to believe? More than a few thought that the Europeans were cannibals. Olaudah Equiano, an African captured as a boy who later wrote an autobiography, recalled . . . When I looked round the ship too and saw a large furnace of copper boiling, and a mulititude of black people of every description chained together, every one of their countenances expressing dejection and sorrow, I no longer doubted of my fate and quite overpowered with horrow and anguish, I fell motionless on the deck and fainted. . . . I asked if we were not to be eaten by those white men with horrible looks, red faces and long hair?" The slaves were branded with hot irons and restrained with shackles. Their "living quarters" was often a deck within the ship that had less than five feet of headroom -- and throughout a large portion of the deck, sleeping shelves cut this limited amount of headroom in half.4 Lack of standing headroom was the least of the slaves' problems, though. With 300 to 400 people packed in a tiny area5 -- an area with little ventilation and, in some cases, not even enough space to place buckets for human waste -- disease was prevalent. According to Equiano, "The closeness of the place, and the heat of the climate, added to the number in the ship, which was so crowded that each had scarcely room to turn himself, almost suffocated us. This produced copious perspirations, so that the air soon became unfit for respiration, from a variety of loathsome smells, and brought on a sickness among the slaves, of which many died."  The Slave Deck of the Bark "Wildfire"